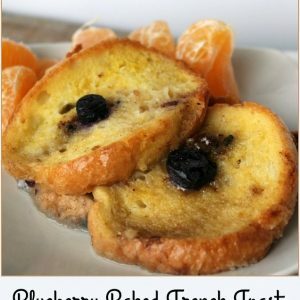 Blueberry Baked French Toast is quick and easy to put together and has several options for getting it on the breakfast table. You can make it the night before and let it set in the refrigerator overnight before popping it in the oven for a hot delicious breakfast. You can assemble and bake it right away for breakfast or a “breakfast for dinner” dish. Or you can assemble it and freeze it for use several weeks later. Use a heavy textured bread — like French or Italian – because that will hold the egg mixture. Because loaves vary in size, it’s hard to specify a quantity. You will need enough to make two layers of half inch slices across your pan. I used about half a loaf of a baguette (long and skinny French bread) plus a 3-4 slices. This is great for soft leftover bread, by the way, although you may need to add another beaten egg with up to a quarter cup of milk if the bread is on the dry side. You can usually judge after you’ve assembled the first layer whether or not this is necessary. 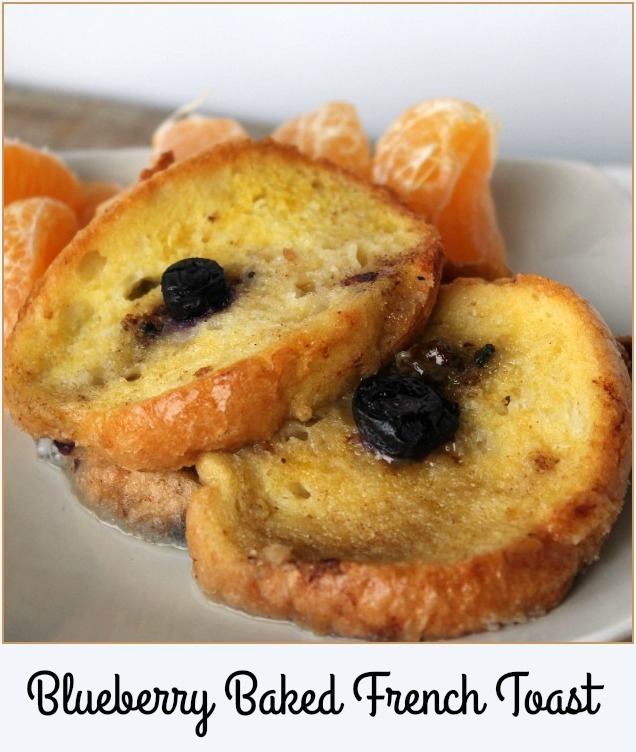 Serve with fruit and sausage patties or links, no syrup needed. And just in case there are any leftovers at your house — heat in the microwave for another scrumptious breakfast the next day. Quick, easy and delicious! Make for breakfast today or make and freeze for guests later! Spray bottom of an 8x8 pan with cooking spray. Sprinkle brown sugar evely across bottom of pan. Whisk eggs, milk, and salt together in medium bowl. Place bread slices on top of sugar in a single layer; sprinkle with cinnamon. Top with blueberries, reserving some of the berries. Repeat the bread layer and distribute the remaining berries over the top. Sprinkle lightly with cinnamon. Optional: Cover tightly and store in refrigerator overnight for use the next morning. Bake in oven, uncovered, until golden and lightly firm, 25 to 30 minutes. Prepare as directed. When French Toast Bake has been assembled, wrap filled pan securely in aluminum foil. Add a layer of plastic wrap to contain any accidental leakage before freezing. Freeze up to three months. Place in refrigerator to thaw in refrigerator for 24-36 hours prior to baking.